Our firm has been operating in the cleaning services industry for many years now and is known for offering an excellent range of household and commercial cleaning services in and around London. We have a large customer base and an exemplary service record which is evident throughout our customer satisfaction levels. No, you do not need to make any payments or deposits prior to the work being completed. We only accept payment for the job once the work has been finalised and you have confirmed that it is has been finished to an acceptable standard. If you are happy with our cleaning work, payment can be made by cash or online. If you provide us with a minimum of 48 hours notice then you will not need to pay a cancellation fee. A charge is payable for any cleaning services cancelled within 48 hours of the start time. Please note that you will also be charged a cancellation fee if we are unable to access your property at a pre-arranged time. We have teams of cleaners in London serving all areas. Whilst we do recommend that you book in advance, we can offer a same-day service for emergency cleaning needs. We advise that you contact us ASAP to secure your booking. Yes, our cleaners work flexible hours 7 days a week so that you can enjoy a cleaning service at a convenient time. We work between 8am and 6pm Monday to Friday and from 9am to 6pm on Saturdays and Sundays. There is no additional charge for early, late or weekend appointments though we do recommend that you book early to avoid disappointment. Are congestion fees and parking charges included in the price? No, if you live in a congestion zone then an additional charge will be added to your cleaning quote. You will also be liable to pay parking charges if a free space is not provided. Our quotes are inclusive of all other taxes and service charges. Where will my cleaner be from? Will they be able to speak English? Whilst most of our professional cleaners are from Poland or Bulgaria they do speak English at a conversational level. An English speaking cleaning supervisor is also available to help with any communicative difficulties, ensuring that you get a consistent service that meets your requirements. Messages or requests can also be relayed to your cleaner via our customer services office. Professional carpet cleaning is a real art and can include many different stages. Firstly, we vacuum your floors in order to eliminate everyday dirt, we then apply a targeted stain removal treatment before washing your entire floor with our top-secret products. After waiting for the treatment to take effect, we then remove the product with our specialist steam cleaning equipment before deodorising the carpet and drying it out. This process can help to reduce the effect of stains, marks and everyday use. Does it take long for carpets to dry? Carpets may take up to 4 hours to dry after a steam cleaning has been performed. We advise you that no heavy furniture be placed within this time as it may affect the carpet. What happens if my carpet gets damaged? In the unlikely event that your carpets are damaged as a result of the cleaning, we advise you to file a claim with our manager. Claims filed 7 days after the service has been carried out will be discarded. We provide all of the cleaning equipment and products required for end of lease cleaning and carpet and upholstery cleaning packages. If you hire one of our one-off deep cleaning services we do ask you to provide us with the necessary cleaning materials. 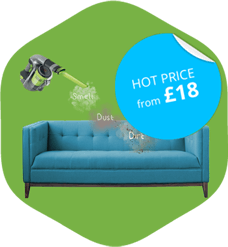 If it is more convenient for you we can use our own cleaning materials for a £13 surcharge. Will there be more than one cleaner? The number of cleaners who tend to your property is dependent on the size of the job. Our specialist carpet and upholstery cleaning services are generally carried out by one member of our professional cleaning team. All other services tend to be completed by a team of two to four expert cleaners. What sort of service quality is guaranteed? We promise to provide all of our customers with an exceptional quality of service. If you are ever left unsatisfied by our end of lease or deep cleaning services then you should log a complaint with our customer services team. Any problems logged within 48 hours of the work can then be rectified ASAP by one of our expert cleaners. Should I defrost my fridge/freezer before you arrive? You should defrost your fridge or freezer before we arrive. This can help to reduce cleaning times. Is oven cleaning included in your end of tenancy cleaning package? All of our end of tenancy cleaning packages include the comprehensive cleaning of your oven and other kitchen appliances. Can you clean the outside of windows? All of our window cleaners are experienced at cleaning the inside and outside of windows. All outside windows that are reachable from inside will be cleaned as part of the service. The cleaning of first floor or higher windows will need to be pre-arranged with our customer services team. What happens if I have booked a cleaner for a longer or shorter period than I need? If we finish your cleaning services earlier than expected then you will only be charged for the relevant number of hours. If we are unable to finish your cleaning services in the scheduled period then we will try to stay as long as possible without causing inconvenience to any of our other customers. You will be charged for any additional hours we spend at your property. Yes, we use state of the art cleaning equipment to ensure that we can offer an outstanding level of service. Our main cleaning equipment is Prochem branded and is joined by an excellent range of specialist cleaning products.